lately i have been trying to merge the partitions two on one hard drive into one so i downloaded Partition Logic and mounted it to a cd as per instructions. when the computer starts it goes to a blue screen that shows a loading bar for visopsys but when it gets to 100% loaded the computer just reboots, loads visopsys and reboots again and again. i figured it could be a problem with the cd so i downloaded, mounted and booted from a floppy to but got the same exact results. could this be a problem with my computer? its pretty old but it has meets all the system reqs. not sure about the processor but it runs windows 98. Hi Paul, sorry you're having trouble with it. It doesn't sound promising -- almost as if there's a problem with the processor being too old. If you have time, I can post links to a couple of 'debug' floppy disk images that will help me to understand the problem a bit better. If it turns out to be processor compatibility, I may be able to give you a custom-built one that has code generated for older CPUs. Let me know if you're game. Here are 2 floppy images. I'm assuming floppies are better for you, than burning a bunch of CDs. Don't unzip both of these at the same time, in the same folder, as the unzipped file name is the same for each. If they both work correctly, then they'll both appear to behave exactly the same way (loader progress bar just stops, but the system shouldn't reboot). These both also print out some information about the hardware that doesn't appear under normal circumstances. CD ROM emulation check failed. 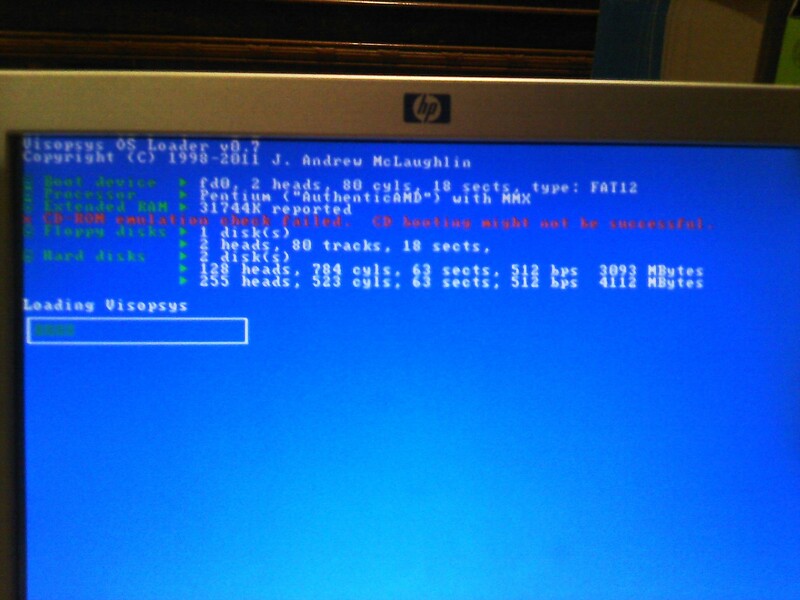 CD booting might not be successful. i also noticed that the second test cycled the rebooted faster than the first. MagnumX wrote: i also noticed that the second test cycled the rebooted faster than the first. Sorry if I misunderstand, but did either/both of these spontaneously reboot? The first one really shouldn't, at least! they both caused the computer to reboot as soon as the loading bar was full. the first test left a rather long delay before starting again whereas the second test caused near instant reboot. The fact that they both rebooted is very puzzling/tricky, but the long delay thing makes me think there are separate issues (if indeed there are any real issues in the first case). I built a new image for you that's 'normal' (i.e. no debugging stuff, no stops) but the code is generated for i386 processors. It's possible that the real issue is just the processor instruction set - though I'm only 50% confident. Care to give this one a try? Disk IO error: Sense operation failed. The boot device or media may require service. The filesystem on the boot device may be corrupt: you should use a disk utility to check the integrity of the filesystem and the Visopsys files. 1 unrecoverable error(s) were recorded, and the boot process cannot continue. Any applicable error information is noted above. Please attempt to rectify these problems before retrying. Hmm, that actually does sound like a media error. Can you retry with another floppy, perhaps?